Don't fight harder in Modern Warfare 3; fight smarter. Infinity Ward and Sledgehammer have picked up a few tricks from real-life Special Forces soldiers for Modern Warfare 3 and added folding scopes into the game. They've also added some of the latest in grenade launcher technology into the mix as well. The folding scope is exactly what it sounds like: a magnifying scope that folds down out of the way. This allows the weapon to be used at a wider variety of ranges, and thus make the weapon more versatile. 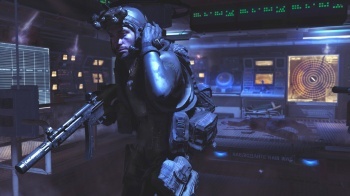 Infinity Ward's Robert Bowling said that the feature came about after conversations that Infinity Ward had had with Delta Force operatives, who had to adapt to new situations quickly and effectively. "Say you're picking guys in windows out long range in Manhattan, but then kick through a door and start clearing a building," Bowling explained. "You can now fold down your magnifying scope and already have a close-range optic on your gun. So now you're engaging guys close-target without having to change weapon." The folding scope isn't the only toy that's been added to the Modern Warfare 3 arsenal either. Players will also be able to play with the XM25 Airburst Grenade Launcher, which is designed to detonate grenades in the air, taking out enemies behind cover. The XM25, also known as the "Punisher," uses smart technology to precisely control when the grenade explodes. "It's great for when you're fighting in an urban environment," said Bowling. "If a guy is behind a concrete barrier, you can laser-tag that cover point, fire over it and it will then program the round to explode one meter past it. Anyone hiding behind it will be showered down."